Bassel Safadi and his wife Noura. Photo from Noura Ghazi Safadi's Facebook page. Update: On August 1, 2017, Bassel Khartabil's wife Noura Ghazi learned  that her husband was executed by the Syrian regime almost two years ago in 2015. 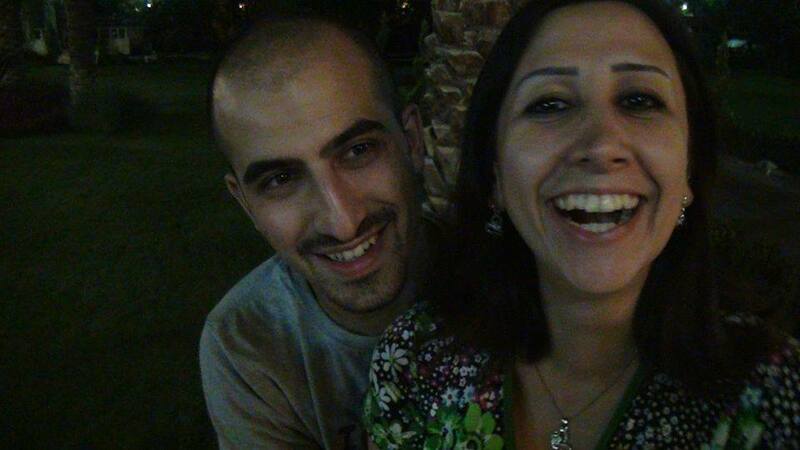 She wrote this love letter to him in February 2015, nine months before she received unconfirmed news  that Bassel had been sentenced to death. Between then and August 1, neither Noura nor Bassel's supporters were able to confirm the execution or his whereabouts, and for the last two years Noura has been living in the hope of being reunited with him. March 15 marks the third anniversary of the detention in Damascus of Bassel Khartabil —also known as Bassel Safadi—a well-known Syrian-Palestinian blogger and open-source software developer. A Creative Commons leader in Syria and active in projects like Mozilla Firefox and Wikipedia, he is credited with opening up the Syrian Internet and extending online access and knowledge to the public. According to the European Parliament, his detention is part of Syrian government efforts to restrict access to online communities and stifle freedom of expression in the country. I cannot write a poem on Valentines’ day, I really must see you, I need to steal words from your eyes, I can only think of your eyes now. And when I really deal with your eyes, I have no words. I cannot think anymore, I am thinking of Syria, ouch Bassel. It hurts, Syria hurts. Bassel, I am very afraid, I am afraid about the country that is being slaughtered, divided, bleeding, being destroyed..
March 15, the day of Bassel's arrest, is also the day that commemorates the start of the Syrian popular uprising. In the spring of 2011, when citizens from across the region took to the streets to demand freedom, dignity and justice, anything seemed possible. Four years later, the dream of Bassel, Noura, and many others, has become a nightmare. Syria is under constant threat, though the suffering of its population no longer makes the news. Just recently, government bombing killed more than 150 people, without making any headlines. Today, only the atrocities committed by Daesh (ISIS) are in the news, and the Syrian people are also their hostage and victim. To those of us who know and love Syria, what happens in this country pains us deeply, and even more so as it becomes increasingly invisible to the rest of the world. We are hurt by the more than 200,000 killed, the hundreds of thousands of detainees, the displaced, the refugees, those who continue to suffer unimaginable torture in the government’s prisons, those who suffer the tyranny of groups such as ISIS who have their own agendas and interests, and who are enemies of Syrian richness and diversity. These unique and irreplaceable people, have become numbers and statistics so vast that the UN has failed to register them. In particular, indifference hurts. The images that no longer provoke indignation, the documentation of atrocities that accumulate in unvisited video files. The selective empathy of those who classify the victims as imperialists or anti-imperialists, legitimate or illegitimate based on geo-strategic politics, and of those who add the denial of pain to the pain. It hurts more than the loss of a loved one, because there is no therapy for the loss of a country. The wounds never heal. To those who love her, the hurt felt by Syria is never-ending.